Russian gymnastics legend Svetlana Khorkina, when she’s not busy talking about whether American gymnasts are doping and what she really thinks of WADA (hint: she likened them to a certain WWII Axis power), can be found lending her expertise to the Russian speedskating team—she’s now listed as a “specialist” for the Russian team—or talking about Russian politics. In Khorkina’s most recent interview with Sports.ru (translated by Luba—a personal friend of mine—of Gymnovosti), the current record holder for “most world championships medals won by a female gymnast”—one of the last records left for Simone Biles to break—went all in on the situation in Crimea, Russian prisons, America’s school shootings, the length of the presidential term. You know, the stuff we’re used to hearing about in interviews with former Russian gymnasts. Khorkina retired from gymnastics following the 2004 Olympics. She began serving in the Duma, the lower house of Russia’s parliament, in 2007 along with rhythmic Olympic gold medalist Alina Kabaeva, who has long been rumored to be Vladimir Putin’s mistress. This line of whataboutist rhetoric is hardly new. Throughout the Cold War—and certainly during the Civil Rights movement—the Soviet Union frequently covered the racist, inhumane treatment of African-Americans as a way of puncturing the myth of American freedom and democracy, and broadcast U.S. injustices to people in Asia, Africa, and South America. Also, the Soviets extrapolated from the United States’ treatment of blacks to their regard for all people of color. This was particularly damaging to the American government, which was trying to create alliances with countries in the global south, which had significant non-white populations. Khorkina is absolutely correct about the reality of American racism and the inhumanity of our criminal justice system. It’s just that “America being terrible” is not really a defense of the Russian-perpetrated abuses that the reporter presented to Khorkina for comment. And Khorkina was invoking these examples from the United States as a way of deflecting criticism away from Putin, who the reporter suggested was responsible for the brutality in the prisons and the high Russian murder rate. She wasn’t exactly speaking out of a meaningful concern for victims of American racism. For Khorkina, the demise of the Soviet Union was unfortunate. “My opinion is that it’s a pity that the Soviet Union broke down. I guess, its time has come. And after the USSR’s breakdown there were mistakes made in a number of areas,” she said. Khorkina came of age as an athlete during this period, entering the senior ranks in 1994. NBC covered the breakdown of the USSR and its impact on its legendary sports programs, especially its once-dominant gymnastics program. In their short pieces on the Russian women, they showed the deterioration of Round Lake, the famed training center outside of Moscow. The paint was peeling, the gates were rusted, the equipment was falling apart. Previously, the training conditions at Round Lake and other gyms had been among the best in the world. It’s not surprising that, that Khorkina, as an elite athlete, would see the dissolution of the Soviet Union as a bad thing. Once again, Khorkina is certainly not wrong about the economic instability and the suffering that took place after the collapse of the Soviet Union and the transition to a market economy. 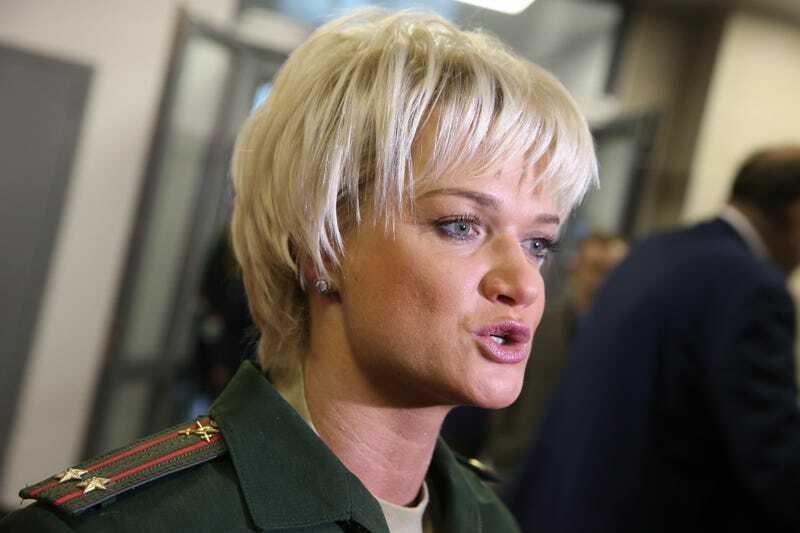 When the reporter noted the percentage of the population that lives at or below the poverty and questioned Russian economic and budgetary priorities, highlighting the increased military spending, Khorkina once again countered with how much money the U.S. spends on its military. Again, very true. Both Russia and the U.S. are completely fucked up! As you might imagine, Khorkina, given her membership in the ruling party of her country, isn’t particularly keen on protests. Khorkina even asked the reporter if she had participated in any protests—the reporter said that he had. The reporter then pushed Khorkina for her specific thoughts on protests. You can go on protests and get paid from abroad for doing that or you can work and improve your successes so that, as a result of your work, the country would move to the leading positions in many areas. We have the freedom of speech now, the democracy – go on, express your opinion, just don’t break the law. In Khorkina’s mind, it seems to be an either/or proposition—you can either participate in protests which are financed by foreigners or you can actually do something to help. While it is true that Khorkina is a former high-level athlete, it is equally true that she has spent the last decade very involved in politics, making these questions entirely fair game. But Khorkina, as you might say, wants to stick to sports.